Control Pad Blues – Page 2 – Life, games, memories. …here’s my collection so far. I enjoy kicking back, popping some corn and watching a great flick from time to time. My DVD collection is extensive enough that I never get tired of the old favourites, but there’s still a pretty big list of popular movies that I have yet to see for one reason or another. The Godfather, Scarface, 2001: A Space Odyssey, the list goes on… even with Back to the Future and Indiana Jones, I enjoyed the first ones, but haven’t taken the time to watch their sequels. Now, I wouldn’t exactly consider the Addams Family movies as being on my “must see” list, but I do remember them being incredibly popular. They really seemed to be everywhere for a while in the early-to-mid 90’s; McDonalds Happy Meals and collectible cups, lunch boxes, cartoons, toys, and of course, video game tie-ins. 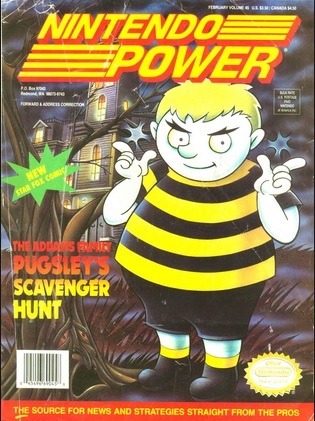 This issue of Nintendo Power was – to say the least – pretty underwhelming. There weren’t any mind-blowing game announcements in the Pak Watch section, no fun tips or tricks in Classified Information, and the contest that month was also pretty lackluster… surprisingly, the only interesting part was a walkthrough of the game on the cover. I enjoyed the colorful screenshots on display, so I decided to give the game a shot. 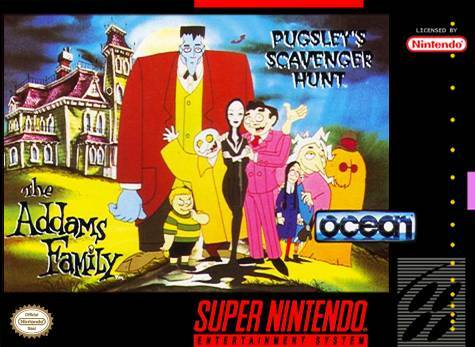 Pugsley’s Scavenger Hunt plays a bit like Mega Man in that you can tackle the levels in any order you want. 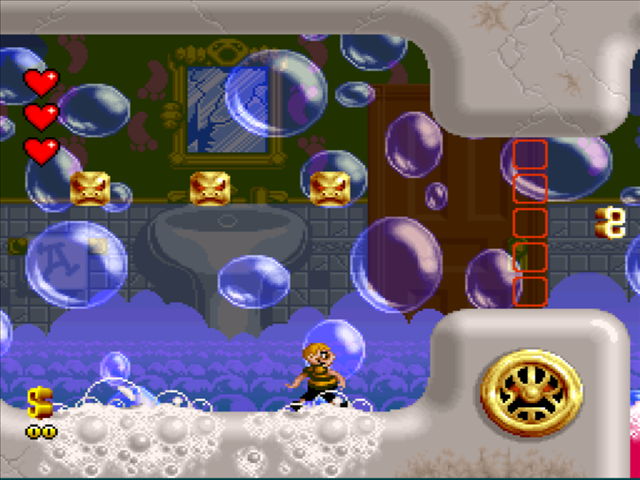 The idea is to collect an item from each room in the household, each of which having a specific theme – in looking at a playthrough just now, the only level I actually remember playing through was the bathroom one… go figure. In retrospect, I think I just enjoyed the graphics and art style from this stage more than any other. Check out the detail on that soap scum!! Anyway, it’s a pretty straightforward platformer, and there certainly isn’t anything revolutionary about it… it was your typical TV show cash-in. Plain and simple! There are two things I vividly remember doing the weekend I rented this game. That actually explains why I don’t remember the game all that well – I was too busy doing other things that were obviously much more fun! The first memory is about going to my friend Mike’s birthday party. It was hockey-themed, and pretty much just consisted of playing table hockey inside and having a street hockey tournament outside. I also remember us going down the street and around the corner, out of our parents’ line of sight, just so we could light a firecracker or two. The part I was most excited about was the party favours we got just for showing up. There was something like 15 kids at the party, so the names of 15 NHL teams were written down on pieces of paper and put in a hat. One by one, we drew from the hat, and whatever team name we had drawn, we’d get an official cap with that team’s logo on it. These hats were really awesome and top-of-the-line, too – I remember some of them being close to $100 or so… that made these party favours pretty damn cool. For some reason, I was among the last to draw. I didn’t exactly have a favourite NHL team at the time, but I did have a favourite color – green. While the other kids hoped to get a Montreal Canadiens, Toronto Maple Leafs or Calgary Flames hat, I was hoping for a Minnesota North Stars or Hartford Whalers one. As I reached into the hat for the draw, I closed my eyes and hoped for something cool… I ended up getting an even better one than I expected. This exact hat! Well, this design, anyway. The Sharks were still a new team, and I wasn’t all that familiar with them. Once I had a spiffy new aqua-colored baseball cap with their logo on it, I became a bit of a fan. I ended up adopting the Detroit Red Wings as my favourite NHL team since my dad had been a fan since the Gordie Howe days, but I have a handful of teams I always root for on the side. 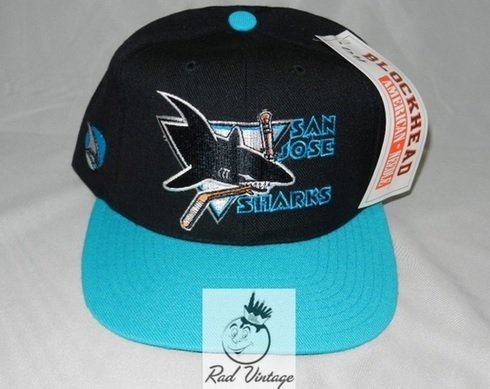 The Sharks have consistently had great teams through the years, but have yet to win the Stanley Cup… maybe soon! The second thing I remember doing that weekend was going to a maple syrup shack with my dad. The day after the party, we hopped into our 1990 Nissan Sentra and headed out to Keswick Ridge, NB. Dad listened to his Merle Haggard cassette on the car stereo, and although I didn’t enjoy the music all that much, there was something pretty damn infectious about “Okie from Muskogee”. Apparently, Muskogee is a place where even squares could have a ball… I didn’t quite understand why they “waived old flooring down at the courthouse”, however. Ahhh. 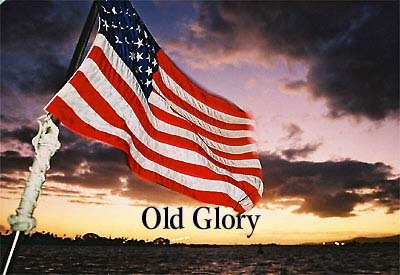 Old Glory. *Not* old flooring. Anyway, Dad knew the older gentleman who ran the sugar shack and thought it would be a good idea for us to pay him a visit. I wasn’t really into maple syrup that much at the time, but I really was quite impressed with how far out in the woods his cabin was. It was so quiet, and the most peaceful spot I’ve ever been in. I remember how muddy the dirt road was getting there, and how the sun was shining through the trees as we walked through the woods. It wasn’t quite spring, and although there was still a fair amount of snow on the ground, it had morphed into that “crystallized ice” stuff it turns into when the warmer weather rolls around. We found the little shack, walked in, and there was this older fellow in overalls on the other side spreading something really nasty-looking on a piece of bread. Sure, there were giant boiling vats of sap (or whatever it is that makes maple syrup), and the place smelled great, but all I could focus on was whatever the hell he had started putting on that slice of bread just as we walked in. Was it pate? Was it some sort of Spam-like ham spread? I really had no idea, and as he walked over to shake our hands, I swore I could still smell it on him… it was kinda like cat food. We talked for a little while, and since there wasn’t anything ready for us to sample (unless we waited a few hours), we ended up leaving after about 15 minutes. It was a memorable trip deep into the woods, and I had a fantastic time seeing a bit of the maple syrup-making process, but I was gagging on the car ride back home just thinking about the smell of whatever he was eating. I’m kinda gagging now just thinking about it, actually. That Merle Haggard though, man. Great voice. I started the last post by saying I was a lucky kid, and I’m more or less starting this one with the same sentiment. There were two pieces of technology I was lucky enough to use on a semi-regular basis, and I didn’t know many others who had the opportunity to do so. The first one is a VHS camera that my dad would borrow from his workplace from time to time. We were able to capture moments as early as when I was four months old, and as I got older, various moments of our lives were recorded on tape for us to cherish forever. I recently converted these tapes digitally, and I realized then just how lucky I am to have so much to look back on. On a few of the occasions the camera was in our house, I would use it for my own purposes! We still have that Mario\Zelda blanket, my favourite NASCAR driver is still Jeff Gordon, and my favourite TV show is… not Friends or Boston Common, I know that much. The game collection (top-right) has grown, though! The other device I am incredibly thankful to have used from time to time is a laptop computer. My sister had an electric typewriter for when she was in college, and I would often turn it on to type random things onto a sheet of paper. They were usually just lists of random stuff I was interested in – Ninja Turtles characters, video games I wanted, video games I owned, Toronto Blue Jays players, whatever came to mind. I don’t know why I had fun putting these things on paper, I just did! The typewriter was quite loud – especially when hitting backspace, which I did a fair amount. My sister didn’t want to risk having me break it, and everyone around the house was probably sick and tired of hearing the grinding parts each time I hit a letter, so I wasn’t always allowed to use it. I eventually lost interest in typing random stuff, but the day my dad brought a laptop home from work re-kindled that hobby. It was obviously for him to work on some sort of document, but I saw it as a flashy new toy. One I was extra careful with, but still a toy nonetheless. 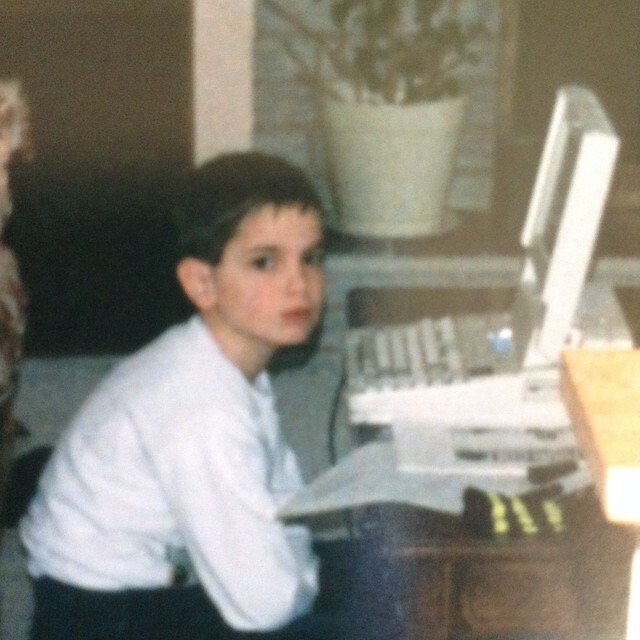 I can’t remember any brand names the laptops had, but I do know the first ones he brought home ran on DOS. Before too long, I was accustomed to all the commands you normally used. “cd a:”, “cd wordperfect” and “wp” were the only ones I really needed at the time, however. I changed fonts (even though there weren’t that many), wrote in bold, italics and underlined, and just marveled at how easy all of it was. Everything was in black and white, but that was fine. I wasn’t in a position to be picky. Eventually, Dad brought home a laptop that ran on Windows. 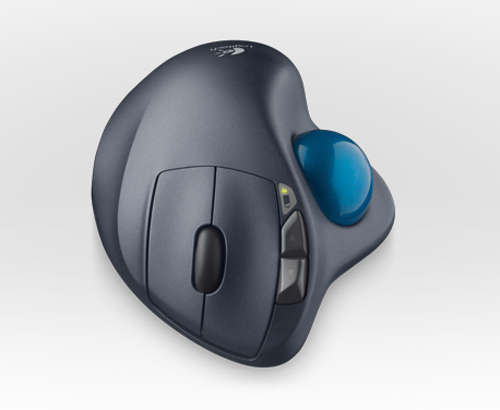 I’m not entirely sure which version it would have been, but it was also the first time I ever saw a trackball mouse. If this was the direction computer mice were taking, I wasn’t very happy about it – the old computers we had at school had mice that were clunky squares with three big buttons, but at least they were intuitive to use. The mouse Dad brought home was quite messed up. Your thumb moved the trackball, your index finger rested on a curved arch where the *tip* of your index finger pressed the left-click button, and the joint of your index finger rested on the right-click button. It made for a lot of accidental right-clicking, so I didn’t play much Solitaire before moving onto something else. Like this, except it was light gray in color; the “up and down” arrows seen here were where the main buttons were and ran the length of your finger. It was awful! 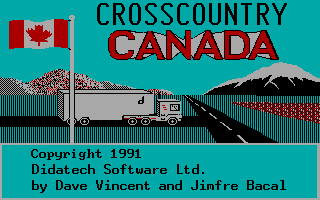 That “something else” I usually ended up playing was the edutainment classic, Cross Country Canada. Such beautiful fields of blue grass and red lava. CCC was a text-driven transport truck “simulator” set in Canada. The goal was to teach not only our great country’s geography, but also the commodity each city and town was known for. For example, you’d have to make a trip to Charlottetown, PEI or Edmundston, NB to pick up a load of potatoes, while Fort McMurray, AB was the place to go if you needed oil. Having to pick up stuff like Zinc, Sulfur or Nickel was a bit challenging to me at first, but the game taught me that I had to travel to Yellowknife, Grand Prairie and Sudbury (respectively). The animations you’d see when you actually picked up the commodity varied from city to city, which was a nice touch. As you traveled the Trans-Canada highway, you’d have to stop for food, sleep, gas, and whatever else you needed to survive the trip. You could risk an accident or a speeding ticket by typing “SPEED”, or even pick up a hitch-hiker if you were feeling generous enough… you could never be sure if they’d leave peacefully or steal your commodity at knife-point, so I rarely stopped for them! The game’s presentation is imprinted on my memory, and it’s undoubtedly my favourite edutainment title of all time. Watching footage of it brings me right back to sitting on the living room floor, playing on that black and white laptop… simpler times, man. I was a pretty damn lucky kid. From the day I was born, my parents paid into a trust fund for my post-secondary education. Whenever the time came for me to choose a college or university, my only worry was making sure I chose a field I would actually enjoy studying. 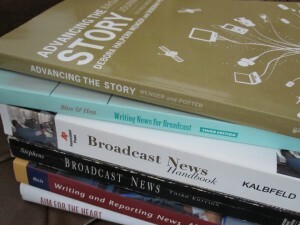 There was a bit of paperwork to fill out and faxes to be sent to and from the Registrar’s Office at STU, but when I eventually chose Journalism as a major, everything was pretty much paid for. Because of this, I didn’t feel pressure from my folks to get a job while I was still in high school. I had friends working at restaurants and big box retail stores, and although they were making good money, they’d sometimes show up to class absolutely exhausted. My grades were only decent as it was, and I didn’t need anything to hinder them any further. In the spring of ’02 after writing my last exam of the year (at university – I graduated high school in ’01), I decided that being 18 without anything noteworthy on my resume was not good at all. I applied at a few different places and landed a couple interviews, but being new to that process, I was nervous and stutter-ey enough that I didn’t get a call back from any of them. I started my second year that fall, and it wasn’t long afterwards that I managed to snag a job at the liquor store in uptown Fredericton. I learned pretty quickly that having a job is a lot of work (duh), and that working 8:30AM to 10PM shifts was as hard on the head as it was on my feet and back. 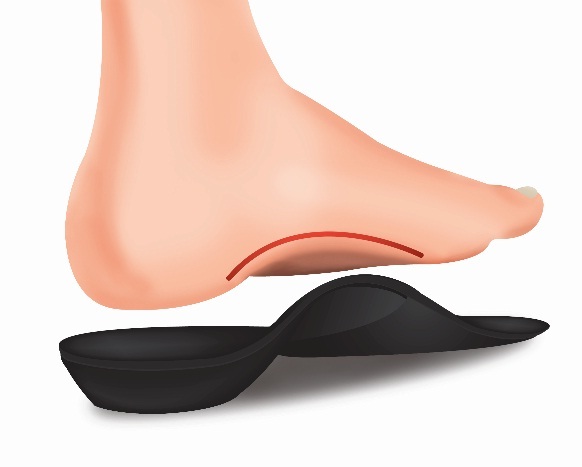 Arch supports – the best investment I ever made, in that it helped me not quit that job. Working on a regular basis was quite the wake-up call. I went from being a lazy kid who lived at home to being a young adult who had responsibilities. Crazy! Six months into it, I was getting into a pretty good rhythm. I was well-trained, did a good job (I thought, anyway), got along well with my co-workers, and even decided to take a year off from STU to save money before going back a year later. On one Saturday morning, I went to work feeling particularly good. It was nice and sunny, and my shift was only from 11AM to 7PM. This allowed me to sleep in in the morning then get home in plenty of time for that night’s NASCAR race in Charlotte, NC. Almost immediately as I walked into the store, one of the assistant managers called me into the office with a serious look on his face… I was going to be asked to work an extra three hours until 10PM. I just knew it. I had to put my foot down, though; I had some serious plans! 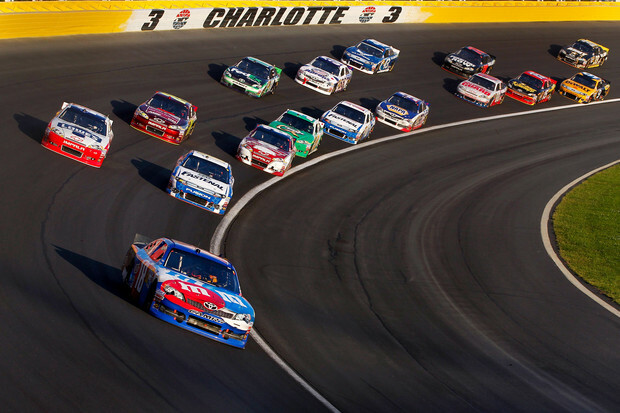 “Serious plans”: watching cars go around Charlotte Motor Speedway for a couple hours. I took a seat and was promptly told that a fellow employee’s father had unexpectedly passed away, and that she was out for the day. I’m not sure how, but I was the only guy available to cover the time she was out. Now, if you were to put me in this situation at 31, I would have said “yes” in a heartbeat. At 19, however, I had to “think about it”. I went to the lunch room for a bit and mulled over missing at least the first part of the race, the very thought of which made me grumpy. I then thought about what the other person must be going through with the loss of her father, which made me feel awful about playing hardball at a time like this… I then walked back to the office and agreed to work until closing time. It was a decision I wasn’t happy about, but at the same time, I knew deep down it was the only sensible decision for me to make. Having the job was evidently changing me more than I thought it would. Back in the office, the “atta boy’s” and “thank you’s” I got from my superiors only made me feel marginally better. I decided to treat myself to a bit of retail therapy on my supper break, so I went to Zellers next door and bought myself a frickin’ Xbox. 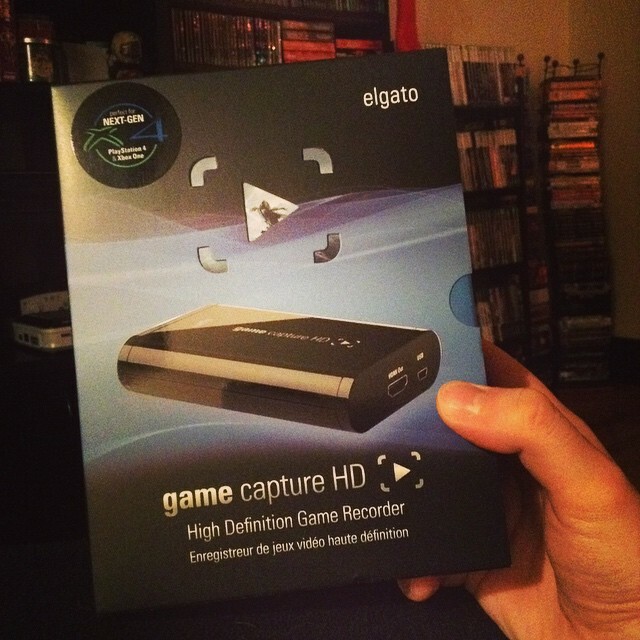 Celebrating maturity and growth… by going out and buying a new video game console. I picked up Enter the Matrix and Star Wars: Obi Wan to go along with the pack-in duo of Jet Set Radio Future and Sega GT 2002. When I got home that night, I was torn between unpacking my new toy and watching the race… then this happened. Gor-don’t spin the other guys out, they get mad. My favourite driver making enemies by spinning them out made my decision to stop watching the race a whole lot easier. I hooked up the Xbox and games well into Sunday morning, and I kept playing it the rest of the week as well… I could get used to this “making mature, adult decisions” thing. As I drive home from work and listen to any old song my iPod shuffles to, I can pretty easily think back to the first time I heard it. At the very least, it’ll bring back a memory or two, much like playing games often does. Not that I’d start another blog based on music memories, but I certainly could do that if I wanted to. 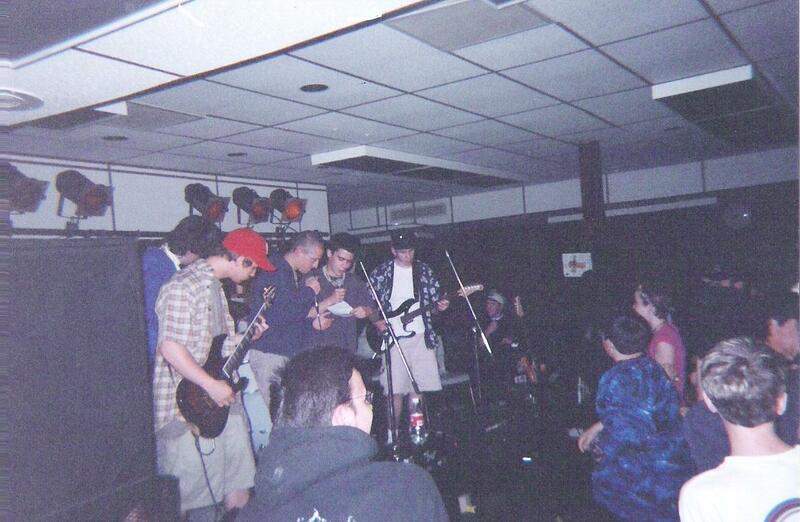 In the spring of 2000 I found out my friend Tom played guitar. I messed around with that red Fender of his as we listened to bands of the day, but I found that chords were not my forte… one string and note at a time was pretty much all I could handle. Tom mentioned that that was basically (bass-ically) what playing bass was like, so I took the plunge and bought one used with a small amp so we could jam. Playing music with other people proved to be way more rewarding than I could ever have dreamed. The simple notion that I could play along – not to mention keep up – with songs I was just discovering and finding a whole new appreciation for was a high I can’t even put into words. It was so damn satisfying. Most of that summer was spent indoors playing Green Day, Metallica and Offspring tunes, or anything else I challenged myself to learn. 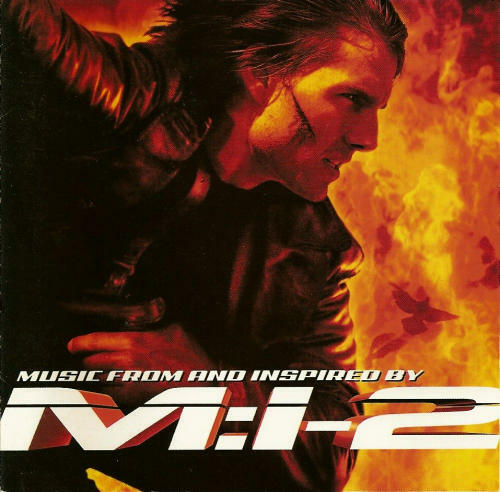 I call it the “summer of the Mission: Impossible 2 Soundtrack”, due to me listening to it (pretty much) non-stop. “DO YAH BURY ME WHEEEN I’M GO-WAWN??? DO YUH TEACH MEEE WHILE I’M HEE-UHHH?? Tom and his family ended up moving out of his house and into an apartment that fall, so jamming together loudly and to our satisfaction was no longer in the cards. The idea of recording ourselves somehow – like we had planned to do while he still lived nearby – also went out the window. By the next year, my skills had improved a fair amount. My friends Justin and Max played guitar and drums (respectively), and we would practice almost every lunch hour in one of the school’s music rooms. One of the teachers approached us and said a few students complained about the noise and asked us to turn our amps down, which we were less than thrilled about. This prompted us to name our band “Quityerbitchin’” after a sticker on Justin’s guitar case… when it came time to perform at our high school’s Battle of the Bands in May of ’01 – the ESApalooza – that name seemed a bit harsh, and we were asked to change it. “No Complaints” was the next name that came to mind, so we went with that. I’m the one in blue behind Tom (the guy in the red hat), who I felt compelled to bring in as a second guitarist for that night. In the fall of 2001, Justin and I got together just for a quick jam session at his house. It was a rainy and depressing Sunday afternoon, and I had nothing better to do. It was also raining at the site of that weekend’s NASCAR race in Martinsville (Virginia), and it didn’t look like they’d be racing that day. With no race on TV, I might as well go jam! New songs we both knew but had never played together, songs we had already covered with Max, songs he had never heard, songs I had never heard, songs we taught each other on the spot… we recorded something like 25 tracks, and it was a blast. I even sang on some of them – not well, mind you, but it was all in good fun. It was quite warm in the room, so we took a break at one point and opened the window. Instead of playing loud and annoying the neighbors, we stopped and played some PC games. The first game he showed me was a one I had heard about, but never had any interest in seeing in action. I just looked up footage of this game, and I remember even less about it than I originally thought. It’s a third-person action game that combines hand-to-hand combat and gunplay. It was developed by pre-Halo Bungie and pre-GTA3 Rockstar Games. 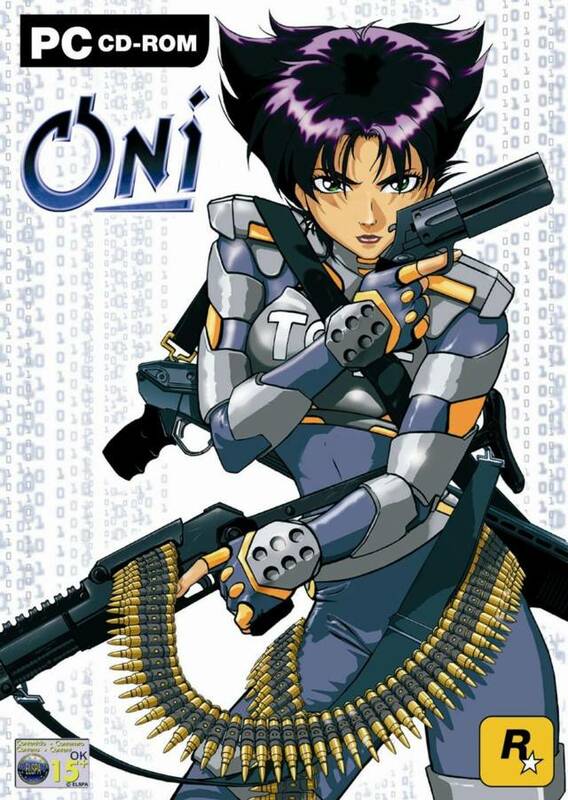 That’s pretty much the only noteworthy thing I know about Oni. 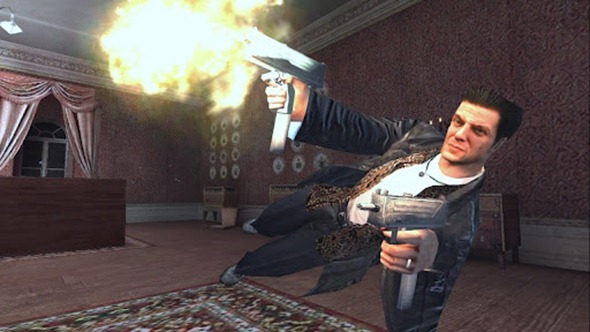 At its core, Max Payne is a dark and gritty third-person shooter that feels like a playable graphic novel. Comic book pages replace cutscenes as a method of storytelling, and there are great voiceovers and sound effects to keep them interesting. It’s pretty unique, and it adds a bit of intensity to the whole thing. One other feature in particular helped add to the game’s appeal; the ability to trigger slow-motion at the touch of a button. Having been popularized in The Matrix a couple years beforehand, it was just a matter of time before games hopped on the “bullet-time” bandwagon. It’s not infinite, but everything goes into slow-mo whenever you need it to; it helps you dodge bullets, allows you dive through the air, and helps you take out hordes of enemies in one fell swoop. From that point on, I knew I had to own this game. I only picked it up about a year later once I got a job, but it was that day in Justin’s computer room that sealed the deal. After playing Max Payne for a while, we shut the window and got back to playing and recording tunes. We ended up burning a CD with all the best stuff we didn’t mind sharing with friends, and deleted whatever we thought was garbage. 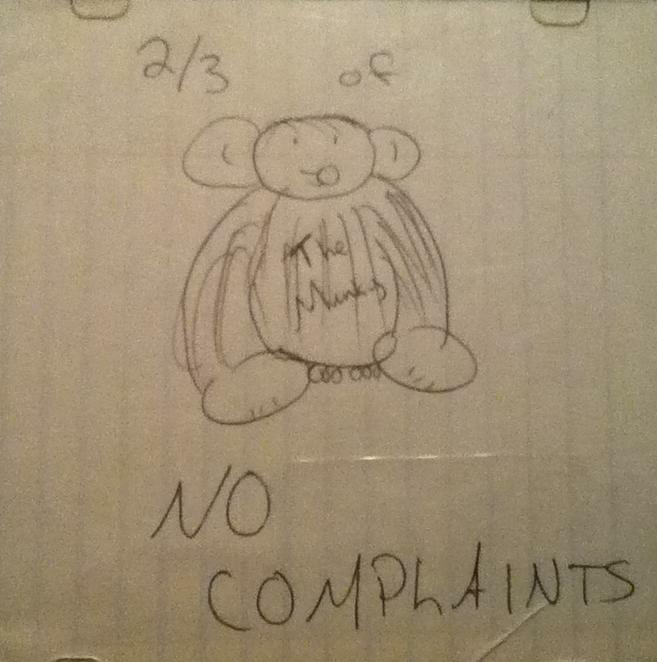 We titled the album “2/3 of No Complaints” – not really all that inventive, but that’s exactly what it was! I brought my portable CD player to campus that week and showed off our work to a few close friends. My friend Mike made a little drawing as he listened to it in the George Martin Hall cafeteria, so I decided to make it my album art. 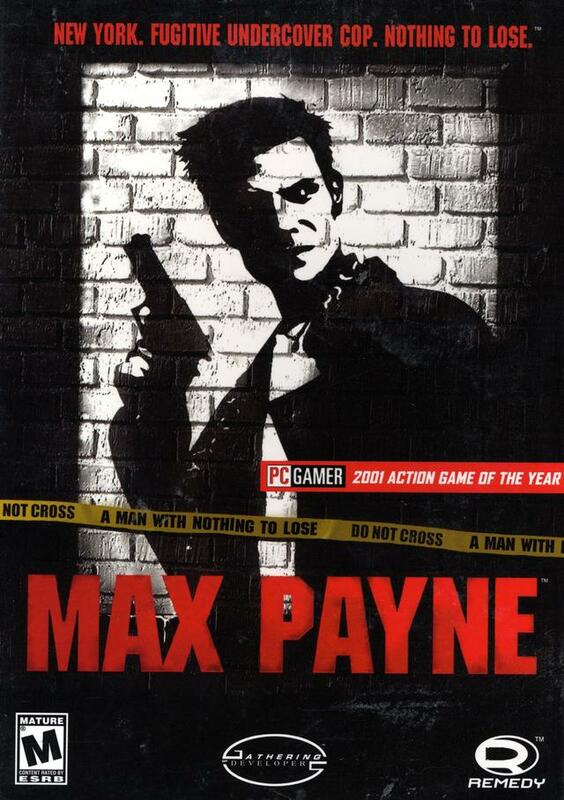 Whenever I think of Max Payne, I can’t help but think of that recording session in Justin’s tiny computer room. It was an absolute thrill to be able to hear the “other side” of us playing music together. That being said, here’s a world premiere 13 years in the making! Enjoy! So after completing every mission on Portland, then Staunton Island, it was time for a quick trip over to Shoreside Vale to see if the old Purple Nines Glitch was still intact. Going through and deleting everything my Xbox had in its memory was a bit tough to do, but in the end… was it worth it? Guess who’s back!! This was taken DURING the mission in question where they didn’t show up before. Whoot! YES! Finally! I can complete this silly little cutscene movie of mine without worrying about any skipped missions. As much as I love this game, this is the third time in a few years that I’ve played through GTA3, and I think I’m done for a while. Much like Ocarina of Time, even the best games get tiresome after a while. Playing through it again wasn’t all for naught, however. 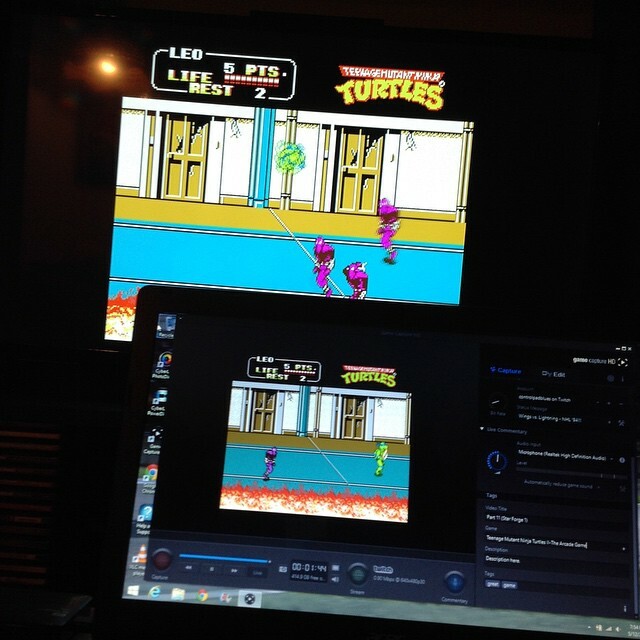 In capturing all the cutscenes, I also let the recording continue through gameplay. There were several things that happened that reminded me just why I love video games so much. It’s those moments that leave you genuinely laughing out loud, screaming at the screen in disbelief, or moments where you barely make it through alive. I’ve decided that on top of my cutscene movies (mostly made for my own enjoyment, by the way), I’ll be putting together a variety of gameplay snippets from the games I play through. Nothing too complicated, and nothing that will blow your mind… just random moments that help remind me that playing games is fun, and that’s what it’s really all about. I might use memes too much on this blog. But then again, I can’t ignore the Bobs. I’ve mentioned it a time or two already, but editing video game cutscenes together has been a hobby of mine for a long time now. Not only does it give me an opportunity to unwind after a long week at work (I don’t know why it does, it just does), but it also gives me a chance to go through certain games as thoroughly as I possibly could. The completionist in me would never allow myself to make a video knowing there was some kind of hidden cutscene I missed along the way! With that in mind, I turned to one of my favourite games of all time – Grand Theft Auto III. I’ve attempted to capture all the cutscenes from this game once already, but it didn’t pan out. The reason? 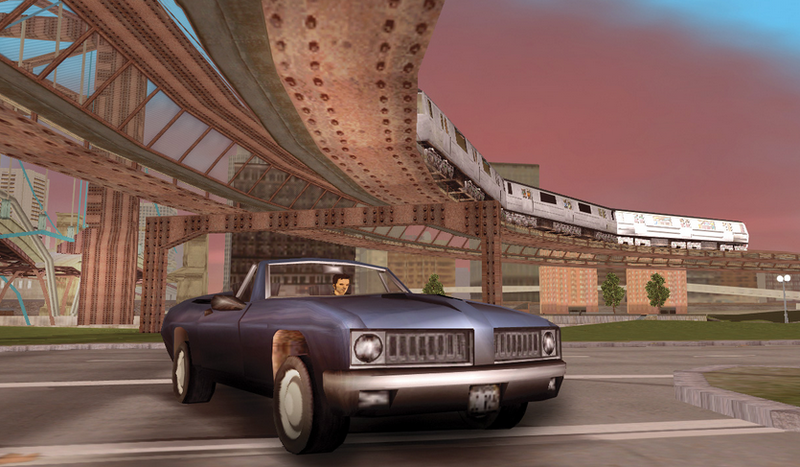 GTA3 takes place over three islands and has you associating with plenty of shady characters throughout the course of the story. On the island of Shoreside Vale, a gang war is brewing between the Red Jacks and Purple Nines. D-Ice, leader of the Red Jacks, contacts Claude via payphone and gets him to run all sorts of fun little errands to eliminate every member of the Purple Nines. 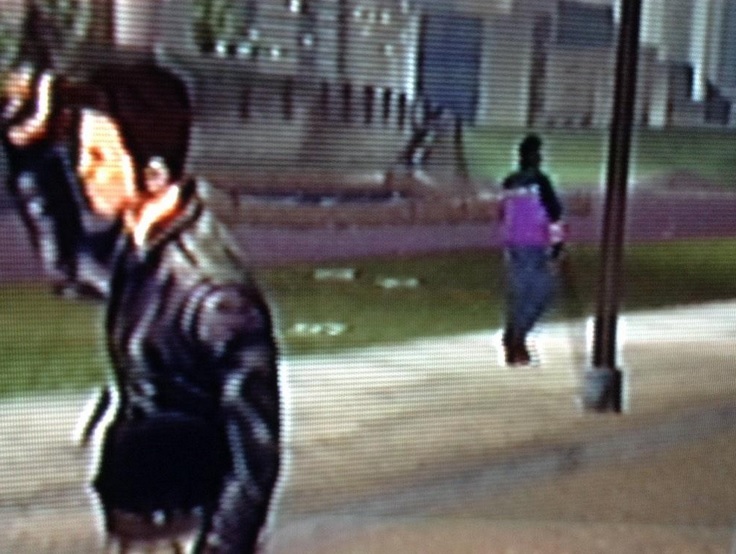 Here’s where the glitch comes in; once you complete the D-Ice missions on the PlayStation 2 or Xbox versions of the game, the Purple Nines are permanently wiped off the face of Liberty City. 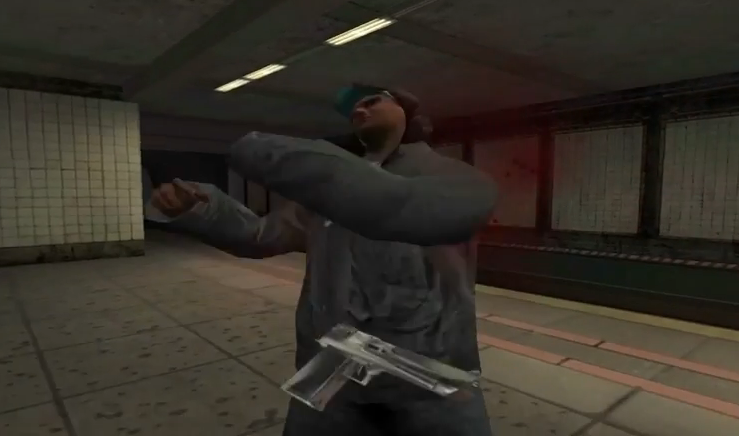 If you start a new game, complete all the missions through to Shoreside Vale and finally attempt D-Ice’s first mission (which has you doing drive-by shootings on dudes in purple), you will notice that there are only dudes in red that show up on the streets – the Red Jacks. You can drive around all you want, but the gang members you’re looking to eliminate won’t show up. Even if you delete your saved game file, there’s enough data on your PS2 Memory Card\Xbox Hard Drive to “remember” that time you completely wiped the other gang off the map. Thankfully, this glitch is a relatively minor inconvenience. The game’s main story missions will be intact, and you’ll still be able to finish the game’s main story. Still, since I’m trying to achieve 100% completion, this glitch is tearing at the OCD part of my brain. I’d love to be able to re-play those missions, and not just because they’re among the best in the entire game. Because I couldn’t get all the cutscenes I wanted, that last playthrough I did went unfinished. I deleted everything I had recorded and put the game aside for another day. That’s when I got to tinkering… ugh, why do I always have to tinker? Y’see, here’s something the true gamer in me has a rough time admitting now. These days, I’m a bona-fide collector of NES, Super NES, Genesis and Game Boy games. About 10 years ago, even though I was deep into all kinds of retro gaming, I was not big into spending money to pad my game collection. Oddly enough, I had more money to spend on that sort of thing then than I do now, living at home rent-free and all. 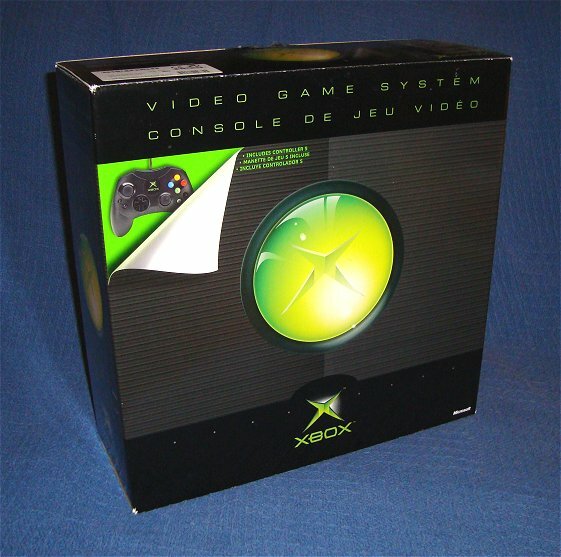 In any case, the idea of doing a soft-mod to my original Xbox to load a bunch of roms and emulators on it wasn’t a big deal. I loaded a disc with hundreds of NES, Super NES and Game Boy roms and got my console loaded with 8-and-16-bit goodness. It’s truly an amazing feeling to have all these games at my fingertips, ready to play at any moment. It changed my Xbox’s dashboard completely, and it allowed me to access components of my console that I’d never even seen before. It’s basically a PC that also happens to play Xbox games! Pretty much my Xbox’s Main Menu since 2005. There are some pretty cool skins available, as well. With the awesomeness, however, comes a slight pang of guilt. Guilt from playing roms instead of the real deal. Guilt that my Xbox is a mere shell of its old, original self. Guilt about the fact that even though it’s fun to play these old games, I can’t do it with the controllers they were meant to be played with. And then… I encountered the Purple Nines glitch. The collector in me isn’t exactly proud of having done the mod all those years ago, and I fully intend to either un-mod my current Xbox or buy another used console for cheap. However, being able to fiddle around with the memory on the system is a benefit when dealing with a glitch like the one I’m dealing with. It took some digging, but I managed to find where the save files were located so I could delete them. Doing so came at a cost, though. The save files that had been on my Xbox for more than a decade were all labeled as jumbled letters and numbers. I wanted to go in there and specifically delete the GTA3 save file on my hard drive and nothing else, but there was nothing to differentiate the GTA3 file from the ones for Halo 2, NASCAR Thunder 2004, Knights of the Old Republic, and other games I’ve played through the years. Because I wanted to overcome the Purple Nines glitch in my own way, I went ahead and deleted them all. Career Mode progress in all my NASCAR games? Gone. Unlocked levels and ships in various Star Wars games? Buh-bye. Progress in “Legendary” mode in both Halo and Halo 2? See ya! That last one was very much a work in progress having not touched either game in about 9 years, but still… it was hard for me to just delete everything and start from scratch. So with all that in mind, I’m not quite done the Portland missions in Grand Theft Auto III. 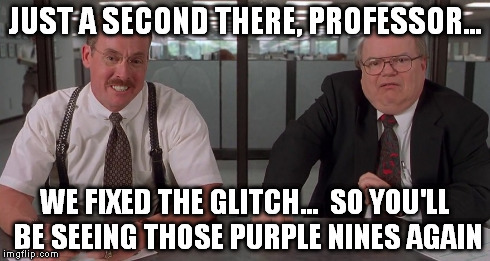 I still have a while to go before finding out if deleting everything off my Xbox actually fixed the dreaded Purple Nines glitch, and the suspense is killing me. If it ended up not fixing the glitch, my cutscene movie will just have to go on without that whole batch of clips, and my mass file-deletion will be all for naught. I better see these jerks. From the age of 8 until I was about 15, driving around town with my sister was a fun way to get out of the house. 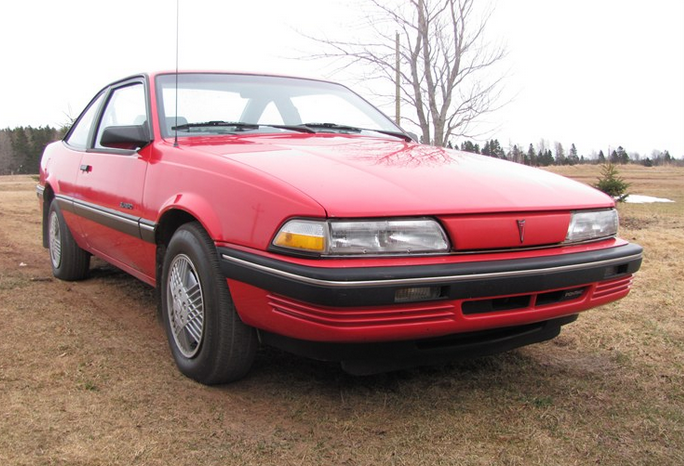 Whether it was in her red ’91 Pontiac Sunbird or her black ’94 Honda Accord, we’d wander around anywhere between Oromocto and Keswick Ridge, usually stopping for a bite to eat somewhere along the way. What a great car… I remember the snowy day she drove this thing home. We’d sometimes end up at one of her friends’ places, or even more interestingly, she’d want to stop in and see people at work. Not necessarily *her* place of work, however. 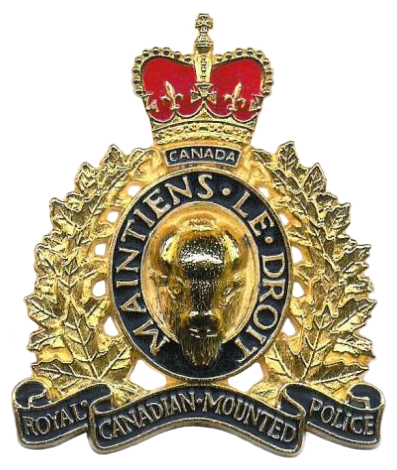 My sister is in the RCMP, and much like myself at my current tech support job, she gets to associate with many people around the province. Dropping in to say “hi” to people you talk to every day is nice, and it helps give you that extra connection with the person on the other end. I was always “Michelle’s little brother” whenever we stopped at a detachment somewhere, but I didn’t mind – these were all top-notch folks that were very kind to me, and I actually hoped to be a policeman myself, someday. There were so many people I met in those years that some of their faces are only brief, fleeting images in my mind. I remember the names and nicknames, but what they looked like is somewhat blurry in retrospect. For one person, however, the memory is quite clear. Probably only because it pertains to video games, but it’s quite clear nonetheless! On one of the last nights I can remember driving around with her in early ’99, we ended up visiting one of her longtime friends and her husband in Oromocto. They lived in a PMQ, and although I just had to Google what it stood for (Personnel\Private Married Quarters), it’s basically where members of the Armed Forces or Mounted Police and their spouses can call home. They aren’t big, but they’re cheap and comfy. In any case, the guy had rented a Nintendo 64 along with a couple games, and Michelle brought me along to give him a few pointers. He was considering buying one himself, so I brought a couple games of my own to try and convince him the N64 was worth it. Who wouldn’t love owning this? The idea was that my sister and her friend would catch up and talk about whatever while he and I played games. That worked for me! He had also rented Star Wars: Shadows of the Empire and Top Gear Rally. I thought (and still think) SOTE was an absolutely fantastic game. Exploring each level thoroughly yielded some cool secrets, and getting every Challenge Point in the game became an obsession of mine. We played it quite a bit that night, but he didn’t seem to be sold on it. He listened intently when I talked about what the game was like in the later levels, but even though he dug the atmosphere and the flying stages, I don’t think he was particularly fond of the controls. We moved on to Top Gear Rally for a little while, which was the first (and so far only) time I played that game. There were some unique vehicles and the controls were pretty good, and we had some pretty fun two-player races… still, it wasn’t long before we swapped it out and played some Mario Kart 64. Michelle and her friend watched us play and laughed as we kept taking each other out with shells and trails of banana peels. I really thought that this was the game that would sell him on the console! 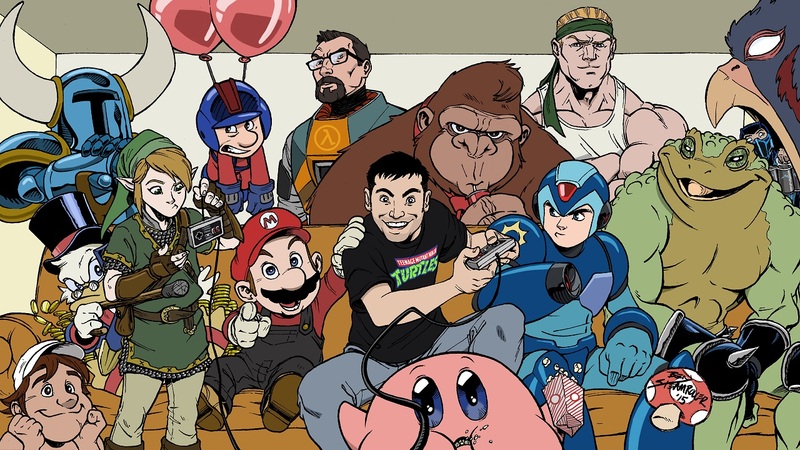 I really don’t know if he ended up buying a Nintendo 64 or not, but playing SOTE that night re-invigorated my love for that game. I went to Wal-Mart with Michelle a few days later and bought it, and even though she said “Wasn’t that game not fun?”, I knew that wasn’t the case. There’s a reason it’s number #33 on my Top 100 list! Being a police officer brings with it a different kind of danger than being in the Armed Forces does. Although the amount of craziness in this region pales in comparison to what happens in foreign countries, officers here still go to work every morning with the distinct possibility that they might not make it back home. Post-Traumatic Stress Disorder is an issue commonly associated with being in the Army, but it affects more than just soldiers; officers, paramedics, nurses, firefighters… even if you don’t have a job where lives are on the line, you could very easily suffer from it after a traumatic event. Unfortunately, it’s a very common thing in today’s messed up world. 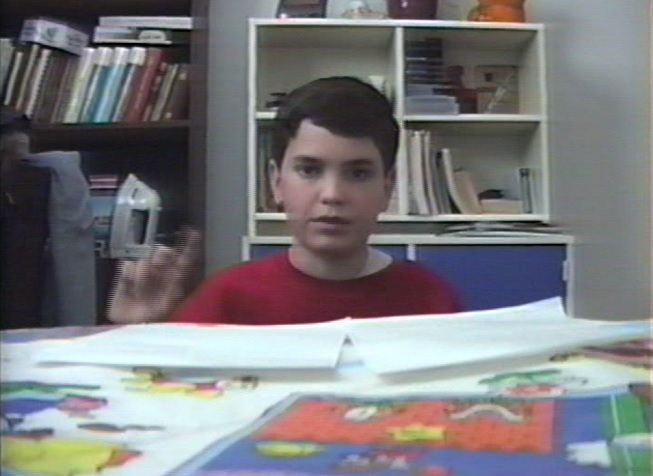 The young man who I tried hard as hell to convince to buy an N64 would one day come to suffer from PTSD. His struggle was very public, and although he brought a massive amount of attention to people dealing with the disorder (and just how little help is available to those suffering from it), the court of public opinion painted him in a negative light. He had made some radical and controversial decisions, but at the end of the day, it was all just to bring attention to his cause. All of what I was seeing about this person on the news such a far cry from the young policeman I played video games with, and “just one of the guys” I’d hear reference to from time to time in conversation. He was a good man, and he went through something a lot of people go through. He did it in his own way, but in the end, it was all just too much for him. I sincerely hope you’ve found the solace you’ve been looking for, Ron. Rest in peace. I’ve already written a fairly lengthy love letter to racing games, so I’ll spare you the details about why I enjoy them so much. My current video project involves old Formula One games, and I’m so deep into it that my “video game brain” can barely process anything else. That’s a poor excuse for the lack of posts this week and last, but hear me out! There are a bunch of F1 racing games dating back to the 70’s, but I wanted to look at games from the 3D era. 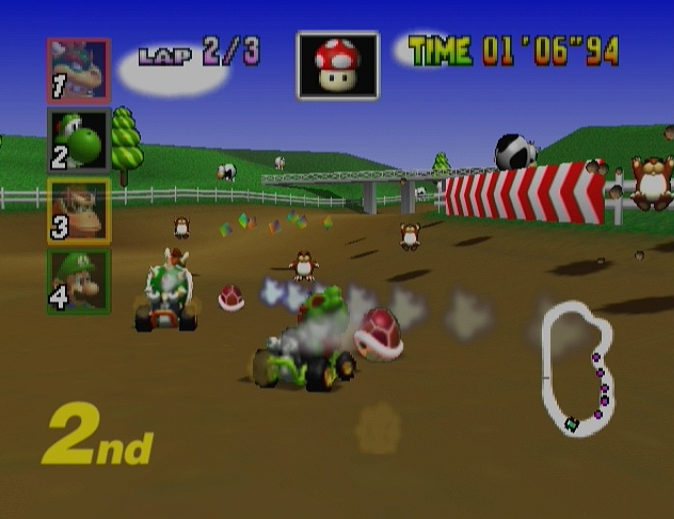 I’d try to look up YouTube videos of what certain tracks looked like in some of the older games, and instead of crystal clear onboard shots, I’d always get either unnaturally smooth-looking emulator versions or a handycam-recorded eyesore. I have capturing equipment and almost all the official F1 games dating back to 1996, so why not just make the videos I wanted to watch? I also wanted to focus on console games, mostly because PC games have had countless mods and custom tracks created for them over the years. I’ve played some great PC racing sims and mods, so it’s not to say I don’t appreciate them… it’s just that there are TONS of those videos online already. 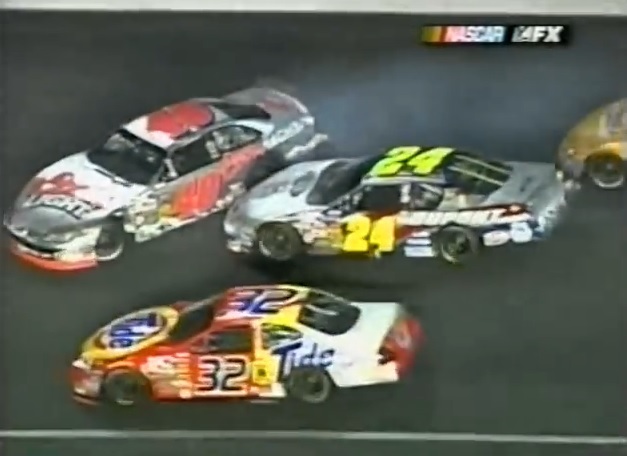 I find real-life onboard videos from any racing series to be fascinating to watch. Seeing masters like Senna, Schumacher, Hakkinen and Prost handle these finely tuned machines with such finesse is like watching Les Claypool effortlessly play the bass riff to Tommy the Cat, or Bob Ross hypnotically hiding his happy trees on that blank canvas of his. Pretty intense, right? Video game onboards don’t really compare, but at the end of the day, I still find them quite entertaining. Console-based F1 games have indeed come a long way. Formula 1 on PlayStation was actually a game I played just as I was developing an interest in all forms of motorsport, so the timing was impeccable. I’ve tried to keep up on “official” F1 games through the years, but since a fair amount of them weren’t released outside of Europe, my “retrospective” can only feature so many games. I also wanted to explore as wide a variety as I could of games from different publishers without delving into the poorly-made ones. Games like F1 Pole Position 64 and Monaco Grand Prix might have featured F1 racing, but were really not up to par with others that have been released over the years. I basically wanted a representation from each season I could. For example, even though it was released in ’96, Formula 1 showcases the drivers, teams and tracks from the 1995 season. There was no game based on the ’96 season, but the ’97-2002 seasons are all represented before F1 games took a small break in North America. Formula 1 Championship Edition was fairly hyped at Sony’s E3 conference in 2006, but after its release in 2007, no official F1 game was released until 2009 when Codemasters took control of the license. The last few years have seen a rise in popularity in the genre, and next month will see the release of F1 2014 on last-gen systems only (weird, I know). I decided not to include F1 2010, 2011 and 2012 because I found they all pretty much looked the same; if a track had a slightly different layout in those games, however, I went ahead and recorded a lap. I’ve been playing all these games quite extensively over the past couple months to get my videos captured, trying my best to get clean laps on every track. Jumping from one game to the next – each of them having unique handling characteristics – has proven to be quite mentally taxing, and I’ve fallen asleep several times with laps playing through my brain over and over again. Almost like Senna in the video above, I’m thinking about pushing that limit, even when I’m not playing the game. Either way, I’m finally done with getting everything I wanted recorded, and I couldn’t be happier to be moving on to other games. That being said, here’s the “world premiere” of The Onboard Retrospective of the Hungaroring circuit in Hungary! Also, in order to tie some kind of memory into this post, I feel obliged to bring up one of the more fantastic puns I’ve ever made – and it was related to the Hungaroring. One morning before work last year, I was checking my Twitter, Facebook and Instagram feeds as I usually do. 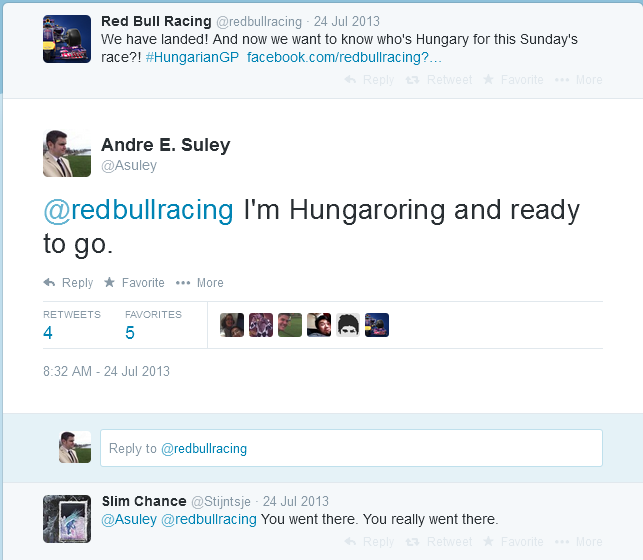 When the Red Bull Racing team’s Twitter account posted about the upcoming Hungarian Grand Prix, I couldn’t help myself. I saw a window of opportunity to crack a silly joke, and I took it. The racing team retweeted it and it got seen by thousands of people around the globe. It might’ve only gotten 4 Favourites and 5 Retweets, but that right there is one of the proudest moments I’ve ever had on Twitter.